Kady never expected her planet to be invaded the day she broke up with Ezra. Even though they are barely speaking to one another, they manage to avoid becoming casualties in the battle taking place around them, and make it to an evacuation point. Ezra is badly injured and taken on board the Alexander, while Kady makes it onto the Hypatia. Off-planet and on separate ships, the relief at having made it out alive soon fades when they realise they are being pursued by an enemy warship with deadly intent. In addition, the people in charge of their evacuation are keeping secrets.To uncover the truth, Kady strikes up a friendship with another hacker and together they sieve through the ship’s data where they discover a plague on the Copernicus – the ship Kady’s mother is on. Ezra has his own problems. His group of cyclones is ordered to bring down one of their own by the AI on board the Alexander, and he doesn’t understand why. When the leaders of his group are executed, he begins to realise there is something seriously wrong with the AI, and that someone wants to cover it up. Resuming contact, Kady and Ezra have to put aside their differences to save the fleet from destruction. Kady and Ezra are imperfect characters who clearly care for the people around them and each other. I love that they aren’t completely focused one hundred percent on each other. The secondary characters make an excellent supporting cast and you feel for each and every one of them. Aidan is an awesome take on a HAL-like AI, but with a twist. I used to think I wasn’t a fan of space-based science fiction, but the last few books I have read have completely redeemed it for me. 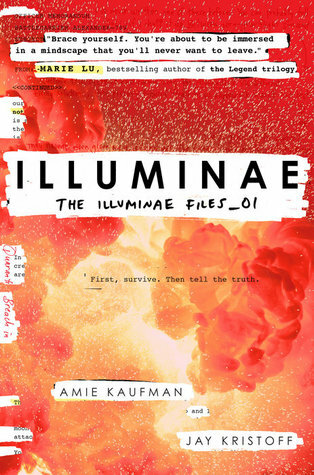 Illuminae is quite possibly the best Sci-fi (including adult novels) that I’ve read in recent years. I loved this book so much when I finished I went and bought Gemina straight away. You can read the review of that book here.